Many open water swimmers around the world, myself included depend on so many pieces of the jigsaw fitting together when we commence our swims, one of the most important factors on which it is difficult to place a price, is that of your support crew and pilot who provide your eyes and ears, whilst you are in a state of sensory deprivation. I really enjoyed Beth's heartfelt words and asked if I could post them here...she stated she would be honoured and thanked me for asking! Its us who are honoured and lucky to have such people around. It is such a great feeling knowing you can trust in your guide be it in the ocean or lake...thankyou to all my support team, and for Beth for writing this piece..all pics except the ones of KGB are courtesy of Beth. Before the veil of stars gives way to dawn, the rhythmic sound of stroke-after-stroke is the only indication that anything disturbs the vast and relative calm of the Catalina Channel. The synchronized efforts of swimmer and kayaker, slowly but methodically slicing their way through the swells, are but a radar blip on the universe’s screen. The night is eerily and barely illuminated by several light sticks and the dim shadows of the support boat in the distance, so darkness prevails while Catalina Island fades and the Palos Verdes Peninsula beckons. 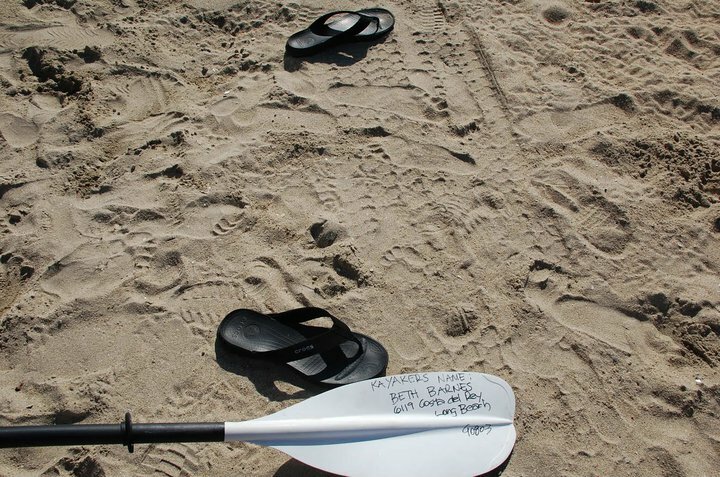 It is a slow, methodical, and heroic journey - a Southern California pastime that few can imagine and fewer still will experience. Open water swimming is a sleeping giant, yawning and stretching and ready to awaken with a roar. It won’t be long until athletes of all abilities, keen for the next big challenge, grab cap, goggles and body grease and challenge the open water. Few, however will find the strength of mind and body to brave this cold and foreboding channel. If they do, they’ll need me, or someone like me, in a kayak next to them. These waters can be welcoming and calm, or they can be wild and uninviting with currents that are unpredictable and treacherous, and the cold is an ever-looming demon. According to the Catalina Channel Swimming Federation, the 2010 season was a record year for swimmers with over forty elite athletes attempting the sanctioned swim. During the 2009 season there were just fifteen crossings. The Catalina Channel is a challenge on par with the English Channel, but the wait for optimal conditions does not hamper the marathon swimmer in California as it does the one at the white cliffs of Dover. For a small group of committed and elite marathon swimmers the Catalina Channel is also but one swim in a trio of swims that comprises the Triple Crown of marathon swimming. The Triple Crown is earned by swimmers who complete the Manhattan Island Marathon Swim, the English Channel Swim and the Catalina Channel Swim. Less than forty athletes have earned this illustrious accolade to date, and U.S. Masters swimmers Jim Barber, 51, who swims for YMCA Indy SwimFit, holds the record for taking the longest time – 22 years - to complete the swims. Rendy Lynn Opdycke, 27, from Novaquatics Masters, completed the challenge in an impressive thirty four days. 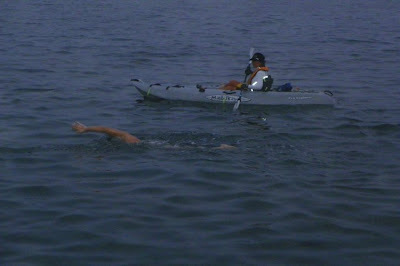 Due to the unpredictable conditions during the daylight hours, swimmers begin their Catalina crossing around midnight from a small, secluded and very dark cove on Catalina Island’s west end. They have to travel there from the California mainland, crossing the very channel they will immediately have to cross again under their own power. In order to complete a sanctioned and official swim, a trained Catalina Channel Swimming Federation observer is on board the support vessel that will transport the swimmer and their team to the island. During the two hour boat ride, the observers are finalizing details and ensuring each team member understands what is expected. The team will usually include family members, friends and pace swimmers, all of whom understand the intensity of the occasion and all of whom are there for one reason … to support their swimmer. To complete the personal and hand chosen team, there will be two support kayakers who may be strangers to the swimmer and family, but they will be equally committed. The volunteer kayakers will take shifts throughout the night and will be constant companions, stroke-by-stroke during the journey, moving in unison with the swimmer in order to keep them on course. If their course is altered in any way this can add extra strokes to the swim which will mean wasted time and extra distance. “Without a competent kayaker who knows the challenge of the open channel, including a positive attitude, the swim would be more difficult to navigate. We depend upon kayakers to be our ears, eyes, compass and lane line so we only have to concentrate on every stroke that takes us closer to our goal,” says Barber. The swimmer is flanked by the pitching support boat on one side and the steadier kayak on the other, and although they dance to the same song, the steps are occasionally altered due to swells, currents and winds. The swimmer will sight from both boats, so they are illuminated with dull yet visible light sticks, purposely kept dim in order to avoid attracting sea life. There is a reverence about swimming under these conditions, and although it is often unspoken, an undercurrent of deep respect for the swimmer prevails. 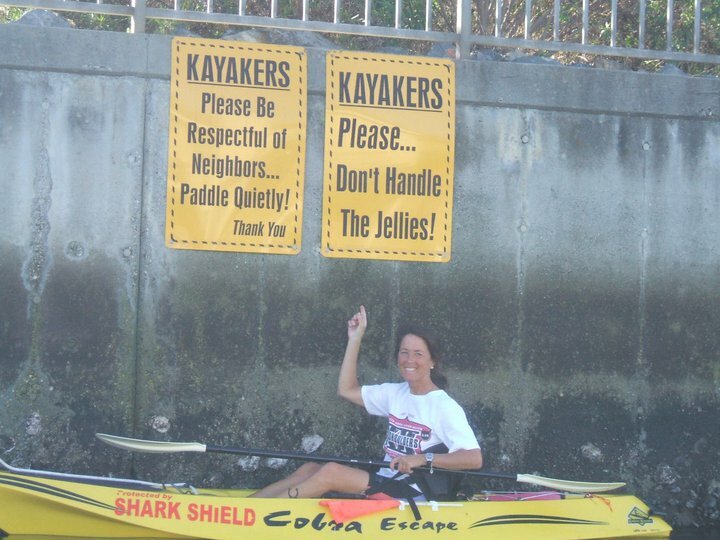 The support kayaker is the first line of defense in the event of personal distress but most of all, the kayaker is the security blanket for the swimmer. The Catalina Channel in the darkest hours of a starless night can be an unnerving place and the company of a kayaker is a comfort, a dim beacon in an otherwise black night. It is a privilege and a terrific responsibility to be that comfort. The pace of the kayak is determined by the pace of each individual swimmer and although it seems easy, it takes strength of mind and body to maneuver a kayak across twenty one miles of open water and fortitude to remain awake. Kayaking is often done in shifts of two to three hours but six to eight hours is my goal so the swimmer is disrupted as little as possible. It is a humbling and grueling endeavor, and these marathon swimmers are athletes of the highest order who understand that mental attitude is just as important as physical prowess. They could so easily confront the channel with the intention of conquering, but instead, they come only to connect, not to conquer. The channel reprimands ego but rewards humility so the swimmer must understand that all bragging rights are earned after enduring great difficulty. As the trio of swimmer, kayaker and boat move toward the mainland, the swimmer’s support crew finds their own quiet corner of the pitching vessel to claim as their own. They settle down to watch the slow but methodical progress. The swimmer is lost in a private aquatic world as months and possibly years of preparation are put to the test. The kayaker watches the swimmer and probably wonders, why? The crew on the boat watches both swimmer and kayaker and wonders, why? The swimmer swims while the kayaker paddles. Two slow moving blurs in the middle of a vast and pitch-black ocean; synchronizing their strokes from one shore to another. It is as simple as that. Beth is awesome! She kayaked for me a couple of weeks ago around Naples Island and I have been on a few channel swims where she keeps a diligent eye out for the swimmer. She is an impressive, dedicated soul!